Is a convenient fast-melt throat lozenge. 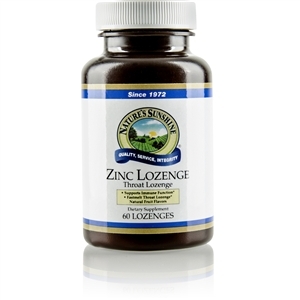 The mineral zinc boosts the immune system. Vitamin C also supports immune function. Zinc (from Zinc gluconate, Zinc acetate), Vitamin C (from ascorbic acid), plus sorbitol, mannitol, stearic acid, natural flavors (citrus, peach, tropical fruit blend), guar gum, magnesium stearate (vegetable) and stevia leaf extract. Take 1 lozenge each hour or as needed. Allow lozenge to dissolve slowly in the mouth. Do not use more than six lozenges daily.